In New York, the NY Department of Motor Vehicles (DMV) oversees the process for getting a learner's permit and driver's license. As part of the state's graduated driver's licensing (GDL) program, the first step toward getting your very first driver's license is obtaining a New York learner's permit. If you already have your learner's permit and you're ready to get your junior driver's license, please visit our NY Teen Licensing page. If you're new to the state and you have a learner's permit from your previous state, it will not transfer to New York. You must apply for a NY learner's permit following the same steps below. In addition, if you're under 16 years old, you are not allowed to drive in New York under any circumstances. To apply for a learner's permit, you are required to be at least 16 years old. You do not have to first complete a driver's education course; however, if you do choose to take one, you will be exempt from your written knowledge exam. Proof of name and birth date (e.g. birth certificate, U.S. passport, certificate of citizenship). The NY DMV provides a list of acceptable documents. Complete and submit an Application for Driver License or Non-Driver ID Card (Form MV-44). Make sure your parent or legal guardian signs the application. Pass a written knowledge exam (see below). 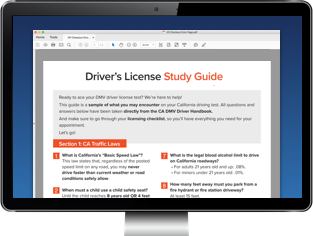 The New York learner's permit exam is based on information about New York traffic laws, road signs, and safe driving techniques discussed in the New York Driver's Manual. The test consists of 20 questions, of which you must answer 14 questions. If you don't pass the test on your first try, don't worry; the NY DMV allows you to retake the permit test an unlimited amount of times. NOTE: You are not required to take the written test if you have a Driver Ed Certificate (Form MV-285). Once you have your New York learner's permit, you are allowed to drive when accompanied by a licensed supervising driver who is at least 21 years old. During this time, you must log 50 hours of supervised driving time with 15 hours being driven at night. On any street inside a park in New York City, or any tunnel or bridge that is under Triborough Bridge and Tunnel Authority's jurisdiction. There are additional restrictions based on what part of the state you'll be driving in. You can learn more about these location-based restrictions on the NY DMV's interactive permit map. If you need to replace or renew a lost, stolen, or damaged learner's permit in New York, you do so by mail or by visiting the DMV office in person. Certain requirements may apply and differ. For more information on replacing your learner's permit refer to our Replacing a NY Permit or License page. Once you have your New York learner's permit in hand, you're ready to continue your quest to get your driver's license. The next step in the GDL process is to get your NY junior driver's license. For steps and details on how to do so, please visit our NY Teen Driver's License page. Social Security Number (or social security ineligibility). U.S. citizenship/Lawful permanent/Temporary lawful status in the U.S.
Name change (if this applies to you). If you are not sure what documents are acceptable to bring in, take a look at the New York DMV website, for a full list.